"Like Moses, We Too Have Been Called by Name." 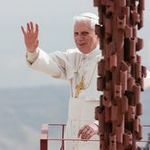 Here is the text of the discourse Benedict XVI gave on May 9, 2009 when he visited the Basilica of the Moses Memorial at Mount Nebo. Tradition holds that at this spot, God showed Moses the Promised Land. "Here the History of Humanity Was Decisively Changed. 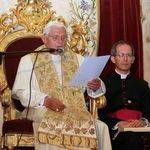 "Here is the text of the address Benedict XVI gave during his visit to the Holy Sepulcher in Jerusalem. "Sadly, anti-Semitism continues to rear its ugly head in many parts of the world. This is totally unacceptable." 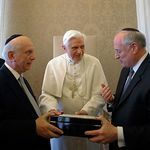 The following is the speech delivered by Pope Benedict XVI at Ben Gurion airport upon his arrival in Israel on May 11, 2009. "We meet as brothers, brothers who at times in our history have had a tense relationship, but now are firmly committed to building bridges of lasting friendship." 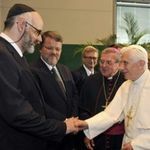 Here is the text of the farewell address Benedict XVI gave at Tel Aviv's Ben Gurion international airport, before boarding a plane to return to Rome. KRAKOW, Poland, MAY 28, 2006 - Here is a translation of the address Benedict XVI delivered when visiting the site of the Auschwitz-Birkenau concentration camp, the last stage of his apostolic trip to Poland. Do you sometimes feel like there is something missing to your faith? Do you have a desire of becoming a part of the Church that Jesus originally founded? What does it mean to be "Catholic"? What does the Catholic Church have to offer that cannot be found in any other denomination? What are ten (plus one) good reasons for being or becoming a Catholic?